The first study in English of Latin American graphic narrative, this book explores the genre’s Argentine and Brazilian traditions, illuminating the different social, political, and historical conditions from which they emerged. “El Eternauta, Daytripper, and Beyond examines the graphic narrative tradition in the two South American countries that have produced the medium’s most significant and copious output. Argentine graphic narrative emerged in the 1980s, awakened by Héctor Oesterheld’s groundbreaking 1950s serial El Eternauta. After Oesterheld was “disappeared” under the military dictatorship, El Eternauta became one of the most important cultural texts of turbulent mid-twentieth-century Argentina. Today its story, set in motion by an extraterrestrial invasion of Buenos Aires, is read as a parable foretelling the “invasion” of Argentine society by a murderous tyranny. Because of El Eternauta, graphic narrative became a major platform for the country’s cultural redemocratization. In contrast, Brazil, which returned to democracy in 1985 after decades of dictatorship, produced considerably less analysis of the period of repression in its graphic narratives. In Brazil, serious graphic narratives such as Fábio Moon and Gabriel Bá’s Daytripper, which explores issues of modernity, globalization, and cross-cultural identity, developed only in recent decades, reflecting Brazilian society’s current and ongoing challenges. 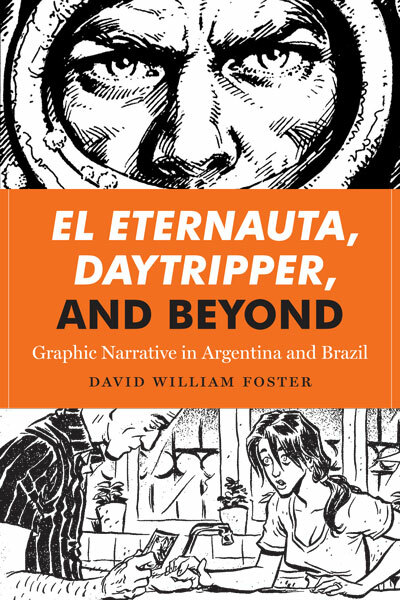 Besides discussing El Eternauta and Daytripper, David William Foster utilizes case studies of influential works—such as Alberto Breccia and Juan Sasturain’s Perramus series, Angélica Freitas and Odyr Bernardi’s Guadalupe, and others—to compare the role of graphic narratives in the cultures of both countries, highlighting the importance of Argentina and Brazil as anchors of the production of world-class graphic narrative. Foster is Regents’ Professor of Spanish and Women and Gender Studies at Arizona State University, where he also leads the Brazilian Studies Program. He is author of numerous books, including Argentine, Mexican, and Guatemalan Photography: Feminist, Queer, and Post-Masculinist Perspectives, Queer Issues in Contemporary Latin American Cinema, Mexico City in Contemporary Mexican Cinema, and Gay and Lesbian Themes in Latin American Writing. Graphic narrative is understood to refer to a printed textual production in which a narrative is told through a combination of graphic images and literary text. On occasion images may predominate and the literary text may be a sort of sidebar commentary, dialogue balloons emanating from the mouths of characters, or a combination of the two. The term “graphic narrative” customarily implies a complex interaction between image and text intended to raise the aesthetic level of the graphic narrative beyond that of single-strip comics and longer comic-book stories oriented toward mass media readers. Although all of these genres may be interesting from the point of view of sociohistorical and ideological analysis, their relative transparency of meaning and the frequently “comic” nature of their stories have tended to keep them in a popularculture category separate from the prestige literature that is the basic fare of academic critical study. At issue is the distinction the Japanese make between manga, comicbook stories of passing or trivial interest, often characterized by recurring thematic and discursive conventions, and gekiga (“dramatic picture”), works considered more serious in intent and effect that engage the reader on multiple levels, characteristically with innovative thematic lines and discursive features. The transparency of artistic representation of the manga/comic book is typically replaced by the often abstract, expressionistic, and perceptually complex imagery of the gekiga/graphic novel. tion, Eisner modeled longer forms of graphic storytelling that required of the reader considerable attention to textual details and a sophisticated understanding of contemporary narrative paradigms. Moving between narrative extensions that appeared to be equivalent to long short stories or full novels, the graphic narrative evolved into self-contained, specifically titled publication units that vied for academic recognition and advanced critical analysis. While graphic novels may be adaptations of literary works (raising the bar on the older practice of “illustrated classics”), readers now look for original creative efforts. Art Spiegelman’s two-volume narrative Maus: A Survivor’s Tale (1986, 1991) is usually considered to have cemented the importance of the independently original graphic narrative in the United States. Not surprisingly, in addition to the awards Spiegelman has received for his novel, including the 1992 Pulitzer Prize Special Award, his work has been the subject of over a half-dozen book-length critical studies. Graphic narratives are now a widely recognized separate publishing and library-collection development category. This monograph examines the development and major texts of graphic narrative in Argentina and Brazil, the two countries with the most extensive production in, respectively, Spanish and Portuguese. Since the concept of the graphic narrative as a unique cultural form is only about two decades old, much of the material, especially the texts examined from Argentina, involved the retroactive assignment of them to that category and their separation from the longer-standing genre of the comic book.5 Precisely an example of such retroactively identified material will anchor the material examined here. I refer to the Argentine Héctor Germán Oesterheld’s famous work El Eternauta, which was originally serialized 1957 –1959. This is also the case with a long tradition of Argentine comic books and what one today would call the emergence of the graphic novel — in the midst of the larger comic-book production — in its appeal to more serious readers than fans of the ever-popular American materials (routinely translated in Argentina into Spanish) and their local imitators. Oesterheld, who prepared the written text, worked with a major graphic artist, Francisco Solano López. The material went on to receive such wide acclaim that the novel was revised in 1969 by Oesterheld and a sequel published in 1975. After Oesterheld was “disappeared” by the neofascist military dictatorship that came to power in March 1976, the Eternauta figure was appropriated and reprised by diverse hands, such that it is now considered a venerable institution of Argentine culture. The original version by Oesterheld himself forms one of the most important cultural texts of the turbulent mid-twentieth century in Argentina, where, despite antedating the brutal military coup of 1976 that led to Oesterheld’s disappearance and presumed murder during the so-called Dirty War against subversion, it is today routinely read as foretelling in a proleptic fashion the “invasion” of Argentine society by a murderous tyranny. Oesterheld may not have been disappeared because of El Eternauta (he became involved, along with his four daughters and their partners, in subversive activities), but his grim fate is directly connected in the Argentine imaginary with his famous novel.Thus, as Oesterheld became committed to left-wing guerrilla movements in the 1970s, this and his other texts came to be invested heavily with significant sociohistorical dimensions that enhance their resonance with readers and are part of the privileged place El Eternauta holds in Argentine cultural production. Concomitantly, the sociohistorical dimensions of Oesterheld’s work underscore the way in which, as far back as primitive graphic illustrations in nineteenth-century Argentina and important local “serious” comic books, this material was viewed as more analytical and engaged as cultural critique than the parallel Disney, DC Comics, Marvel, and Western Comics widely available in Spanish translation in the Argentine market. What all of this means is that the fame of El Eternauta and the by-now legendary aspects of Oesterheld’s person have served to solidify in Argentina the uniqueness of graphic narrative in a way quite parallel to the similar role in the United States of Art Spiegelman’s Maus. The discussion of Oesterheld’s major work will serve to introduce other important Argentine titles that will demonstrate the production in that country of a serious graphic novel tradition before the genre acquired cultural and critical recognition. Graphic narrative production in Argentina is extensive, almost as much as comic-book production had been in an earlier era, and perhaps because of El Eternauta’s privileged resonance, graphic narrative quickly emerged as a major platform for the culture of redemocratization of Argentina in the 1980s (the country officially returned to constitutional democracy in December 1983).7 This, then, will be the basis of the Argentine materials examined here: a series of texts written against the backdrop of social and political issues that emerge from the dictatorship and cultural and critical assessments of it that began even before the official end in late 1983 of the military selfmandate. Not all of the material deals directly with Argentine thematic issues, nor does it all directly reference the 1976 –1983 period of tyranny. However, because of the period of production and the importance of the artists involved — a veritable who’s who of the genre in Argentina — the horizons of consciousness and awareness of the period are not difficult to profile. At the same time, the narratives with foreign settings — for example, New York, in José Muñoz and Carlos Sampayo’s El Bar de Joe (Joe’s Bar)— exemplify the exile experience of these artists, like so many other Argentines, as a consequence of neofascist tyranny. In the case of the Brazilian material, the focus is on a more recent production. Brazil, which returned to constitutional democracy in mid-1985 after a long-running dictatorship (1964 –1985) with rising and falling periods of authoritarianism but little of the overt neofascism Argentina experienced, produced little in the way, after 1985, of the sort of highly defined analysis of the period of repression Argentina did.8 As a result, although comic-book production remains high, as did the production of high-quality graphic adaptations of major Brazilian literary works, it has only been in the past two decades that a strong inventory of Brazilian graphic narratives has emerged. These narratives show little interest in dealing with the sociopolitical issues of dictatorship and redemocratization in Brazil. Rather, they are very much tied to the aggressive culture of modernity that has characterized Brazil in recent decades, a culture that is ever attuned to matters of internationalism, globalization, and cross-cultural identity, especially where English and American life are involved. It is therefore no surprise that the Brazilian material examined, even when it was not written directly in English, as Fábio Moon and Gabriel Bá’s coauthored works now are, shows a high-level consciousness of English, as in the case of Rafael Grampá’s Mesmo Delivery, which is the title of both the Portuguese original and the English translation. And although Angélica Freitas, with her novel Guadalupe, is not the first Latin American graphic artist to set her story abroad, there is a sense of Mexican society and the Spanish language that runs deep in her work. By contrast, the Argentines José Muñoz and Carlos Sampayo’s El Bar de Joe is set in New York but without any real sense of the city: it could well be any of thousands of bars in Buenos Aires as regards existential themes and social issues. The result is a group of texts that very much represents the nature and quality of life today in Brazil, correlating on an artistic level with the economic and political horizons afforded by Brazil’s prominence as a member of the so-called BRICS countries of greatest emerging internationalist development. Because of this contemporaneity, this is an ongoing production, and I could well have included a halfdozen other texts that have been published in the past few years. My specific goal has been to read the texts in semiotic and ideological terms in the attempt to understand narrative design and sociopolitical significance within the respective parameters for Argentina and Brazil.That is, while I am interested in the artistic practices underlying the generation and structure of texts that articulate interpretations of individual and collective lives, I will be particularly concerned with how those interpretations are ideologically circumscribed by social, political, and historical forces that configure Latin American reading publics. Literature is most assuredly viewed in Latin America as predominantly an intervention in public debates over ideological practices of institutions, governments, artists, and citizens as part of their daily lives. While one would not want to overly monumentalize Oesterheld, his disappearance and presumed death at the hands of the military dictatorship attests to the way in which his graphic narratives struck very serious chords in Argentina in the 1970s and why they have been crucial to the cultural production of post-1983 redemocratization. In general, my analytical approach to Latin American graphic narrative parallels my extensive published research on other manifestations of visual arts in Latin America, such as the popular comic, photography, and narrative and documentary filmmaking. There is also a second and unifying dimension to this study, which is the focus on linguistics issues. My interest does not lie in attempting to tease out particular linguistic registers for Argentine or Brazilian graphic novels. Rather, an attention to the materiality of language is one of the major parameters of my research on cultural production, and I find myself continually drawn to how specific linguistic features intersect with semiotic and ideological dimensions of cultural texts. Such issues need to be drawn together eventually as a major topic of critical inquiry, but that remains the subject of monograph to be undertaken at some future time. In addition to the support of the teaching and research programs of Arizona State University, this project has enjoyed the technical and academic support of many individuals. Technical assistance has been provided by Joseph Desamais. Academic support has been provided by colleagues and research associates: Daniel Holcombe, Jorge Gimeno Robles, José Juan Gómez Becerra, Andrés Ruiz Olaya, Élida B. Messina, Enrique Medina, Diego Kenis, Charles St-Georges, Patrick Ridge, Amanda Mollindo. My special thanks, as always, to Patricia Hopkins, my first reader in English, who never lets me forget that sentences usually have main verbs. Note: In providing translations for quotes, I have included brief translations in brackets within the text; longer ones are footnoted. "Foster demonstrates how graphic narratives, through a combination of graphic visuals and literary texts, are the medium for the telling of human stories, for they succeed in transforming everyday situations into visual works of art."